Ye Maaya Chesave was directed by Gautham Menon and co-starred Naga Chaitanya, Sudheer Babu, Krishnudu, Sapan Saran and Surekha Vani. Film was made with budget of INR12.5 crore and grossed INR20 crore at box office. It was debut for both Naga Chaitanya and Samantha Ruth Prabhu. Film tells the story of a mechanical engineering who dreams about becoming a filmmaker. He falls in love with daughter of landlord of his rented house who belongs to Christian family who disapproves their love. She couldn’t convince her parents and also couldn’t marry him without their approval. She breaks up with hero as she couldn’t do anything about it, hero thinks that she is married as per the wishes of her parents. Heart broken hero makes a film with his own life story and after many years he discovers that she was not married. At the end they get married in temple and church. Samantha won filmfare Best Female Debutant award for her performance. Brindavanam was directed by Vamsi Paidipally and co-starred NTR Jr., Kajal Aggarwal, Prakash Raj, Srihari, Brahmanandam and Mukesh Rishi. Film was made with budget of INR300 million and grossed over INR350 million at box office. Due to its success Brindavanam was remade in other languages like Kannada, Bengali, Oriya and Bangladesh. Film tells the story of three young college friends. Hero is in love with his girl friend, but his other friend is in trouble as her parents are making marriage arrangements, she wants to continue her education. Hero decides to help her by pretending to be her lover and he comes to her family to convince them. By his pure heart he wins everyone’s heart and impresses her family members. He discovers that his friend is none other than sister of his lover. Dookudu was directed by Srinu Vaitla and co-starred Mahesh Babu, Nassar , Kota Srinivasa Rao, Brahmanandam, Prakash Raj, Suman and Vennela Kishore. Film was made with budget of INR350 million and earned INR1.01 billion at box office. Due to its success it was remade in Kannada as Power and in Bengali as Challenge 2. Film tells the story of young super cop taking revenge for the injustice done to his family. His father was an idealistic politician and his rivals tried to kill him and he was in coma for several years. Hero tries to improve his father’s mental by acting as a young MLA of his constituency. He takes revenge by killing all those people who were responsible for the accident. Eega was directed by S. S. Rajamouli and co-starred Sudeep, Nani, Adithya Menon, Devadarshini and Santhanam. Film was made with the budget of INR260 million and earned INR1.25 billion at box office. Film tells the story of young couple falling in love, but the antagonist womaniser likes the girl and to get the girl he kills the lover. Dead lover takes birth as a fly and takes revenge against villain. The reborn fly convinces his lover that the villain killed him to get to her, now both join hands to teach him a lesson. Fly hunts him down with the help of his girl friend who happens to be a micro artist. Yeto Vellipoyindhi Manasu was directed by Gautham Menon and co-starred Nani, Krishnudu, Vidyullekha Raman, Anupama Kumar and Ravi Raghavendra. Film was made with budget of INR 20 crore and earned INR 45 crore at box office. Film tells the story of childhood friends who fall in love after several years. During their childhood days they were best friends but due to some reason they broke up. During their college time they become friends again and forget past misunderstandings. Once again the couple had heated arguments over their career and studies and break up. Film ends in both reconciling after realizing their true love for each other. Seethamma Vakitlo Sirimalle Chettu was directed by Srikanth Addala and co-starred Venkatesh, Mahesh Babu, Anjali, Prakash Raj and Jayasudha. Film was made with budget of INR25 crore and earned INR52 crore at box office. Film tells the story of two young brothers with opposite characters. Elder brother is introvert and doesn’t involve in other activities, while his younger brother is very active and fights for justice always. Rest of the story is about how elder brother faces problems because of his unyielding nature and how his brother helps in solving problems. Jabardasth was directed by B.V. Nandini Reddy and co-starred Siddharth, Nithya Menen, Sunil and Sayaji Shinde. Film was made with budget of INR15 crore and earned INR30 crore at box office. Film story is inspired from Bollywood hit Band Baaja Baaraat. Attarintiki Daredi was directed by Trivikram Srinivas and co-starred Pawan Kalyan, Nadhiya, Boman Irani, Pranitha and Brahmanandam. Film was made with budget of INR55 crore and earned INR74 crore at box office, completing 100 days run in the state. Film tells the story of young man who tries to reconcile his aunt and grandfather. His aunt fall in love with a pleader and married him against the wishes of her father, leading to their separation permanently. Hero promises his grandfather that he will bring his aunt for his 80th birthday. He comes to India and joins their family as a trusted driver. He wins the heart of their family members by his good heart. Rest of story is how he takes them to his grandfather. Manam was directed by Vikram Kumar and co-starred Akkineni Nageswara Rao, Akkineni Nagarjuna, Akkineni Naga Chaitanya and Shriya Saran. Film was made with budget of INR50 crores and become blockbuster hit of the year. It was the last film of Telugu legend Akkineni Nageswara Rao who died before release of the film and his son Nagarjuna state the film was tribute to his beloved father. Film tells the love story of two different periods of 1920s and 2013. It is based on the concept of eternal love and rebirth. Two people help the two young couples who resemble their respective parents. Autonagar Surya was directed by Deva Katta and co-starred Naga Chaitanya, Brahmanandam, Ajay, Ashish Vidyarthi and Tanikella Bharani. Film was made with budget of INR10 crore and earned INR20 crore at box office. Film tells the story of young mechanic who by accident kills a goon and spends five years time in jail. He dreams about inventing a battery car and when he comes out of jail he tries to realise his dreams. City Mayor and his goons trouble him unnecessarily and rest of story is how he overcomes all problems. Anjaan was directed by N. Lingusamy and co-starred Suriya, Vidyut Jamwal, Soori, Brahmanandam and Manoj Bajpai. Film was a made with budget of INR60 crore and turned out to be a commercial hit. Film tells the story of a young gangster who was cheated by his own people. He decides to find out the mole in his group and pretends as a handicap brother of himself. His brother like friend was killed by the opposite gang and rest of the story is about how he takes revenge. 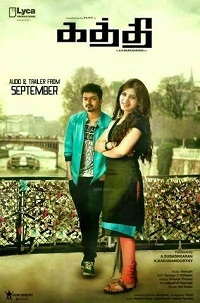 Kaththi was directed by AR Murugadoss and co-starred Vijay, Neil Nitin Mukesh, Tota Roy Chowdhury and Yuvina Parthavi. Film was made with budget of INR700 million and earned INR1.18 billion at box office. Film tells the story of a petty criminal escaping from prison with his friend. He is planning to go to Bangkok but he plans in love with a girl and decides to pursue her seriously instead of escaping. He comes to know about of his doppelgänger and uses the opportunity to escape from police. Rest of the story is about his fights for the villagers rights and wins the heart of people.